Sprinkles, chocolate syrup… any toppings you love! Mix cinnamon and sugar together and ready on a plate to dredge taco shells. Cut out 3-4" circles from tortillas. Heat cooking oil and lightly fry each side of tortilla circles, drain quickly, then dredge through sugar mixture. While still warm, fold into taco shape. 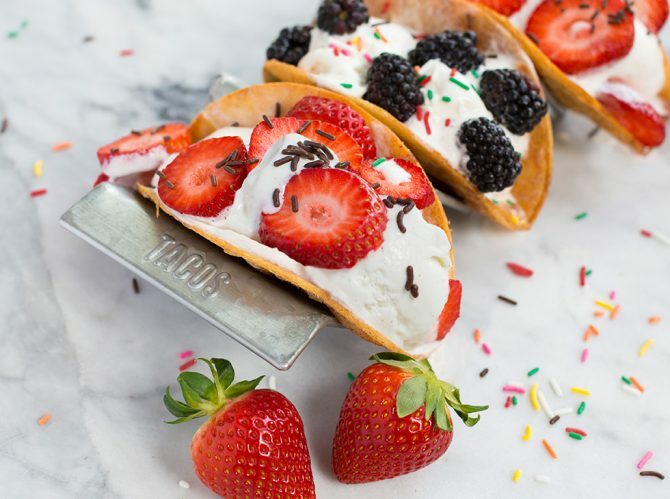 Once taco shells are cooked and cooled, fill half way with your favorite ice cream, top with chopped, fresh strawberries and your favorite toppings. Be creative!